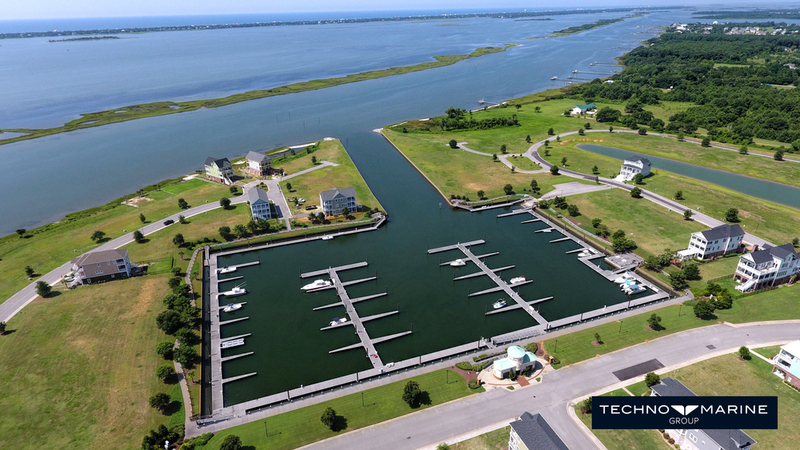 Check out these aerial shots we took for Techno Marine Group in the Luxurious Community of Cannonsgate in Newport, NC. When you ride through the gates of this community, you know instantly that you have discovered a development unique to the coastal Carolinas. The Cannonsgate Marina is a 75 slip marina located in Newport North Carolina on the Bogue Sound Intercostal Water Way. This marina serves the residents of a private 525 lot gated community known as Cannonsgate at Bogue Sound. Cannonsgate at Bogue Sound lies north of Emerald Isle and the Atlantic Ocean, with direct access to the Intracoastal Waterway in Carteret County. It is located on highway 24 in Newport N.C. 5 miles north of hwy 24 & 58 intersection. Technomarine is a manufacturing company specialized in the building and design of custom marina systems. A leading advocate of floating docks and the use of aluminum in the manufacturing of critical docking components, Technomarine has brought new ideas to ports around the world through innovative design and technology for over 30 years. It offers a complete line of advanced docking solutions including complete marina systems, breakwaters, wave attenuators, bridges and gangways, ferry terminals and waterfront access solutions. The company also boasts the world’s only line of hurricane-resistant floating docks. Technomarine has earned a global reputation for excellence that extends beyond the dock to its personalized customer service and technical support. The company also supports a number of environmental causes, including SLINE, a non-profit organization devoted to the study and preservation of marine mammals in the Saint Lawrence River, and steps up to today’s demand for environmental responsibility by reducing waste, reusing materials and choosing locally manufactured materials to minimize its carbon footprint.